Yesterday saw the inaugural sitting of the XIV composition of the Riigikogu that was elected a month ago. Next to ceremonial aspects, the main question concerned progress made on the looming coalition of the Center Party, Conservative People’s Party (EKRE) and Isamaa. Electing the Board of the Riigikogu was the participants’ first chance to demonstrate unity and discipline. The results and other events of the day are good for a number of conclusions and observations. President Kersti Kaljulaid’s speech to the new parliament consisted mainly of warnings: do not toy with democratic values or tear things down. While every politician interpreted the president’s words in their own way, it was clear the speech was aimed at the potential coalition between Center, EKRE and Isamaa. These sentences were a clear reference to utterances and behavior of EKRE politicians who might soon find themselves members of the government. The party’s MPs understood this well enough and did not applaud after the president’s speech. What did we learn from Board of Riigikogu election? The three-way coalition would have 57 formal votes in the Riigikogu. Because the position of Riigikogu chairman is decided during coalition talks, this secret vote is traditionally the first indication of the incoming coalition’s unity. EKRE member Henn Põlluaas was elected for the post with 55 votes. This was the best possible result for members of the potential coalition as it was known in advance that Center member Raimond Kaljulaid will not support Põlluaas, while Isamaa MP Mihhail Lotman was absent. Isamaa leader Helir-Valdor Seeder was elected first deputy chairman with 55 votes. This means that discipline is strong as even openly skeptical Isamaa members Jüri Luik and Viktoria Ladõnskaja-Kubits voted “as needed”. No votes went missing from Center’s parliamentary group either. Jüri Ratas could be at ease, informing the president of his current government’s resignation – a new one is coming. Discussions of ministries and ministerial positions continue in the hallways of the Riigikogu. Helir-Valdor Seeder’s decision to take up the position of Riigikogu deputy chairman is in line with his recent tactic of not belonging to the cabinet. Seeder is believed to have benefitted from being a leader of a government party but not its member. It is also worth noting that Seeder’s seat in the Riigikogu would otherwise go to his in-house competitor in Järva and Viljandi counties Kaia Iva. Other rumors suggested Isamaa will be taking the foreign ministry, while EKRE seems to be undecided in terms of who should run its ministries. It is possible EKRE Riigikogu group chairman Martin Helme will become minister, forcing EKRE to choose a new faction chair. Who will get a keycard to Berlaymont? Questions have also been raised concerning leading centrist Kadri Simson not going to the government. While her reasons are claimed to be personal, it has done nothing to quell speculation that Simson might be aiming for the European Commission instead. Recent information suggests the sides have decided Center will get the position, with Simson and Mailis Reps seen as the likeliest candidates. Center taking the commission post would also explain Isamaa getting the Riigikogu vice chairmanship. The Center Party maintains that who it will send to the Berlaymont building has not been decided yet. EKRE MP Ruuben Kaalep proved a headache for the party’s leaders before and during the inaugural sitting. 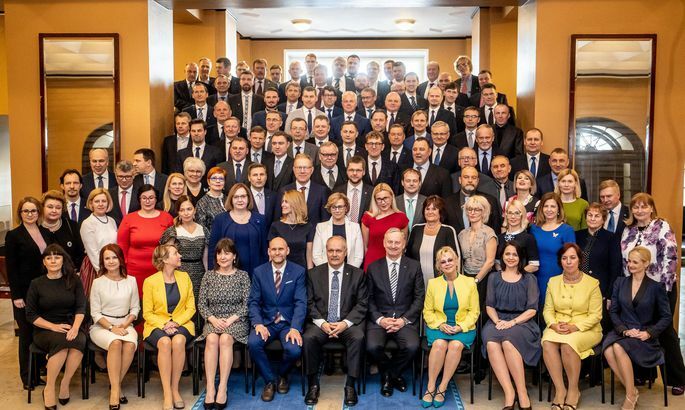 The party that has vowed to alter its rhetoric in the government will have a hard time delivering on that promise in a situation where Kaalep produced a hand sign that could be interpreted as racist in connection with his past actions at the Riigikogu sitting. Chairman Mart Helme literally pushed Kaalep away from cameras when the MP was trying to explain his gesture to the press. EKRE faction chair Martin Helme also seemed ill at ease. It remains unclear what – if anything – the board of the national conservative party plans to do about information published by weekly Eesti Ekspress on Wednesday that describes Kaalep’s connections with radical organizations abroad.